When your applications starts up, the Garbage Collector (GC) allocates some virtual memory to use as a managed heap. It creates a pointer to the next available free space in the managed heap, which defaults to point to the beginning of the (empty) heap. 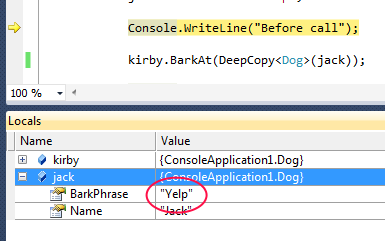 A reference type is assignment compatible if the value being assigned belongs to a type that is either the same as, or is a derived type of, the type of the storage location being assigned to. You can assign a variable of type T to a storage location of type U if T is a narrower type than U, or is the same type as U. 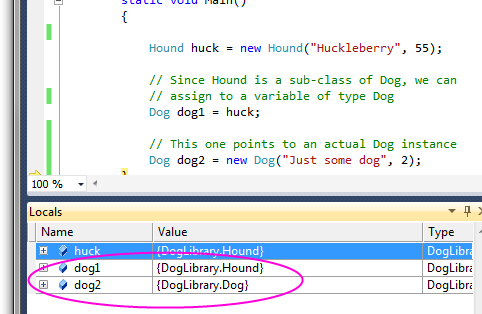 In this case, the variable of type Dog will still be pointing to an instance of a Hound. The assignment doesn’t change anything about the object. To see this, construct an instance of a Dog directly and then compare the objects. Recall that by default parameters are passed by value to a method. A copy of the variable is passed to the method, which means that if the method changes the parameter’s value, the change won’t be seen by the calling code. 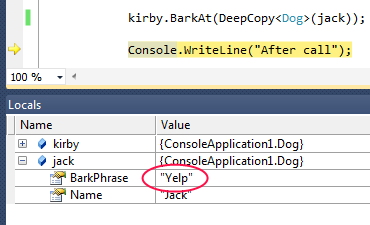 If a parameter’s type is a reference type, however, what is passed by value to the method is a reference to the object. 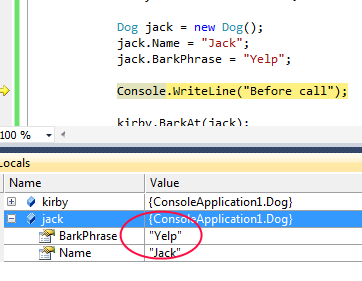 This means that while the method can’t change the reference, it can change aspects of the object that is referenced. As an example, assume that we have a Dog.BarkAt method that takes a reference to another Dog. 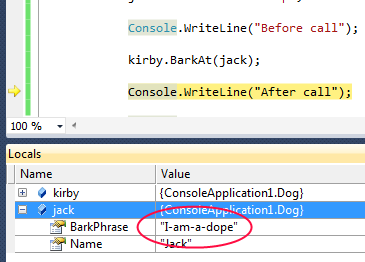 In the code below, the BarkAt method actually changes the target dog’s BarkPhrase. This change is seen by the calling code. Because they are reference types, instances of classes are stored on the heap. When you instantiate (or create) an instance of a class, the actual object is created on the heap and you reference the newly created object with a variable whose type corresponds to the class’ type. The variable that references the object is stored on the stack. Because a class object is created on the heap, you don’t destroy the object explicitly, but it is automatically garbage collected. The object will be a candidate for garbage collection when there are no longer any variables that reference the object. // so he can be garbage-collected.